Pinlock® lenses are created out of a moisture absorbing plastic. The silicone seal on the lens creates an airtight pocket between the shield and lens. The lens is placed between two adjustable eccentric pins, making it easy to install or switch lenses as weather conditions change. Easily cleaned; use lukewarm water or a small amount of mild liquid soap and water and a damp non-abrasive cloth only. Allow the lens to dry naturally. The Pinlock® lens is made of a soft moisture absorbing material; the lens is less scratch resistant than the face shield. Wrap the lens in a soft cloth material when storing extra lenses. 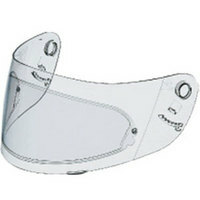 Note: These inserts are for use with motorcycle helmet shields that have the connection posts for attachment. These inserts cannot be used with a shield that does not have the attachment posts. The inserts for the HJ-20, the HJ-20M, the HJ-20ST and the HJ-25 shields will only work with the helmets that use those shields and is only available in clear. Those shields aren’t as tall as other HJC shields and the corresponding insert is also not as tall. These inserts attach to the inside of any HJC Pinlock shield; the drop down menu above specifies which inserts work for your type of shield. The insert for the HJ-20 and HJ-25 shields only comes in clear as those shields are available in different colors. You have to have a compatible Pinlock shield to use this product. We are only selling the inserts on this page. How it works… the lens has a bead of silicone-like material around its perimeter which seals against the clear shield and creates an air space between the two surfaces. The airspace insulates and helps prevent fogging. The assembly can be taken apart and cleaned easily if needed. Neat idea! Pinlock® inserts are interchangeable; pop in the right lens to match your riding conditions. Not all colors are available for each helmet model. The yellow lens gives you that high contrast vision, ideal in misty and rainy weather. The amber lens offers high contrast and enhances low light image resolution. The clear lens is suitable in any weather type with clear, fog-free vision. The light smoke lens is best in sunny weather. The dark smoke lens is ideal for very bright, sunny days.